According to market researcher IBISWorld, conferences and trade shows are a $13.8 billion industry, and growing. There are so many conferences to choose from, especially for companies or affiliates who are specifically targeting the financial industry. Since conferences are not cheap, you want to make sure to attend the event that is the most aligned with your business and personal goals. When deciding which conference to attend, it’s important to not only keep your budget in mind, but also consider the keynote speakers and other attendees. Senior leaders with responsibility for business transformation. Senior line managers responsible for delivering business case benefits from technology implementations. Technology professionals evaluating analytic, business intelligence, or cognitive computing technologies. Anyone in risk management or finance who needs to ensure IT strategies meets = ORSA requirements. Business, technology or actuarial analysts in need of techniques and tools to take a holistic view of technology’s impact on new products and services. Insurance companies such as CAA and Unica are exhibiting, as are several digital agencies. The Financial Brand Forum is the fastest growing and most prestigious annual conference in banking. This conference is aimed at marketing, advertising and branding leaders and other senior-level retail [executives in the banking industry. If you are looking to learn from experts from different financial institutions this conference is for you. The three day conference is jam-packed with breakout sessions and has a line-up of world-class speakers. Representatives from banks and credit unions of all sizes, representing over 20 different countries around the world. 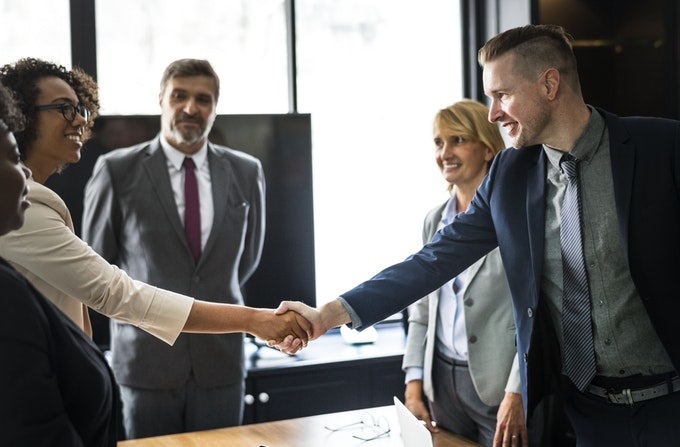 The Financial Brand has welcomed many of the biggest, most prestigious and well respected banks in the world to the Forum, including Wells Fargo, BBVA, RBC, Scotiabank, BMO, US Bank, PNC, CIBC, Capital One, TD Bank +. This is an excellent conference, with a niche focus highly relevant for digitally focused financial services marketers. 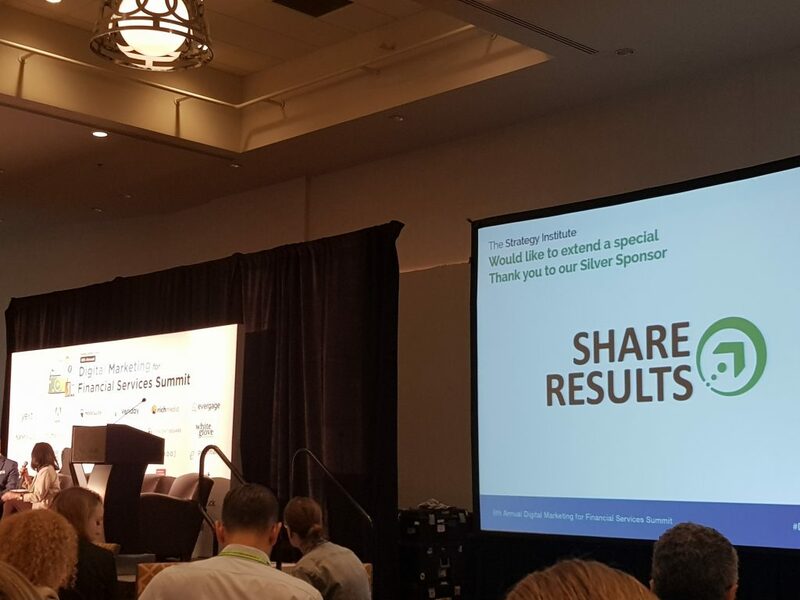 Share Results has attended this conference over the past few years and most recently CEO Nicky Senyard participated on a panel with CIBC’S Digital Marketing and Operations Director, Yuli Shumsky to discuss “Developing an Omni-channel Strategy for Your Financial Brand”. This conference is particularly interesting for both financial institutions and publishers. In fact last year attendees, speakers and exhibitors included publishers such as RateSupermarket.ca, banks such as HSBC and EQBank as well as insurance and investment institutions such as Co-operators. 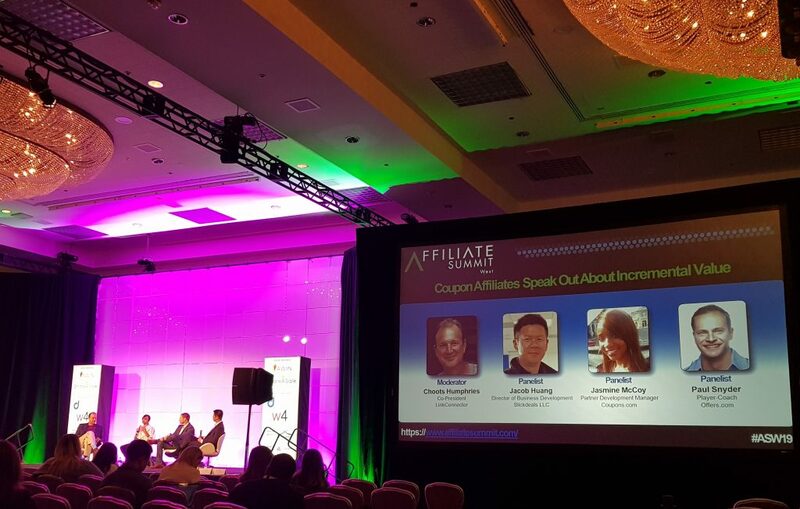 Affiliate Summit run several conferences every year and Share Results recently attended the Las Vegas summit. One of the many highlights of the conference wasthe Finance Meet-up, which was a dedicated time and place for those in the finance industry to network. Though not many financial institutions were present, it was a good conference to attend for people looking to meet US publishers, from financial bloggers to coupon sites, and comparison sites to lifestyle bloggers. The conference in New York will have a variety of networking events in a relaxed environment to encourage the exchange of open ideas and experiences as well as access to online tools to arrange meetings with other attendees and speakers before, during and after the event. FinCon is one of the largest financial content conferences. The majority who attend are personal finance digital content creators but over the years the conference has grown with increasingly more financial institutions attending and participating in the sessions. So if you are are a publisher or a financial institution wanting to meet and learn about financial topics on various topics related to creating better online financial content, promoting that content, and profiting from it, then this conference is worth attending. Digital content creators/influencers and brands in personal finance and investing. Adiverse group of “money mediapreneurs”. Certified Financial Planners, Chartered Financial Analysts, and Certified Public Accountants who want to build or have an online presence. Published authors with books on personal finance and investing. Freelancers who write for multiple organizations, while maintaining their own online platform. CardCon is produced by Jason Steele, one of the nation’s leading credit card journalists and experts and will be the third annual CardCon @ FinCon. It’s a good conference for publishers looking to forge relationships with financial institutions. This is also a valuable conference for publishers wanting to attend the panel discussions, presentations and networking events related to credit cards and consumer credit. In the past, high-level representatives from banks like Barclays and PennFed shared information about upcoming cards and benefits for example. Though the full speaker line-up for CardCon 2019 hasn’t been released yet, last year’s keynote speaker was Clark Howard, a consumer advocate and personal finance expertWe hope that this list of 2019 conferences is a helpful guide in planning your schedule for this year. The second half of 2019 will see some more conferences that are also worth considering such as the CPFC (Canadian Personal Finance Conference) in Toronto. Many don’t yet have confirmed dates or speakers for example so watch this space as we will post more conferences that we think are worth considering in 2019.